Description: The exploitation filmmaker Graig and his friend Neil can't get filming permits from the snooty members of the local filmboard. So Graig dresses up as the snobbiest critic ever to infiltrate their weekly meetings and cheat them out of the permits. 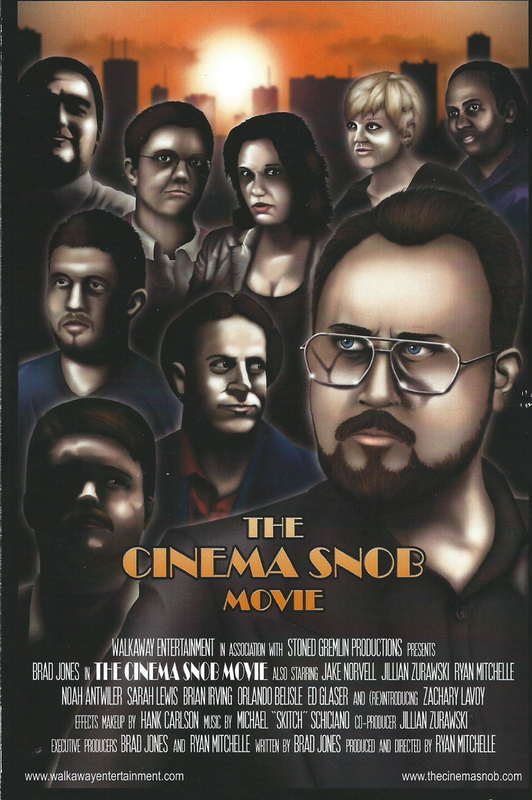 The Cinema Snob is one of the most popular and most productive critics affiliated with the company Channel Awesome. This movie (written by actor and creator Brad Jones) serves to give the character an origin story of sorts, cementing the differences between himself and the character. This movie is pretty good, but let's first get my gripes out of the way. First off, as with the other movie starring Brad Jones I've reviewed on this site (Paranoia) the sound quality is not the best. The lighting however, has been vastly improved. Even though some of the night shots are still VERY dark. Gripes put aside, this movie presents both very dry and very gory comedy, it is also littered with references to exploitation and b-list films and creators. The main character himself assumes the name of Vincent Dawn, a known pseudonym by the filmmaker Bruno Mattei who stood behind such infamous movies as SS girls and Caligula. I imagine it can be fun to see how many references a fan of exploitation can pick up on. That being said, I'm not that well-versed in that particular part of cinema so I was glad to see that there was something for us lesser beings as well. The best comedy in this movie certainly comes from the dialogue. If you like the Cinema Snob, there is well enough reason to watch this. If you're not, give it a try anyway. You may find something you like.